Global Warming is the generalised term used to describe the incremental rise in the average global temperatures above those temperatures predicted from the patterns of data collected over the past years. 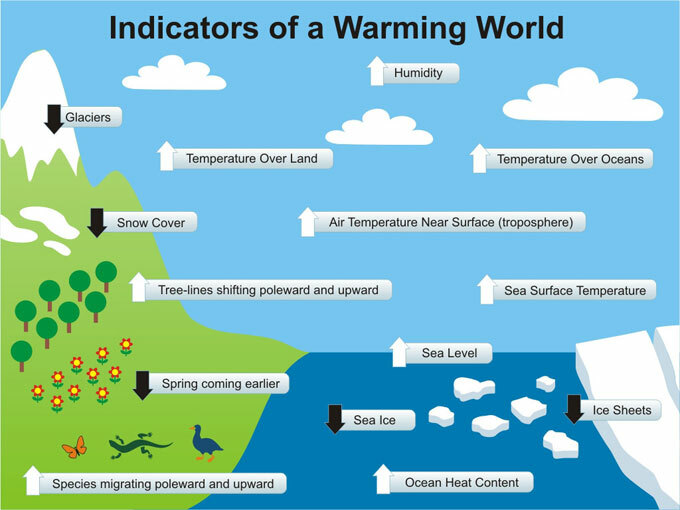 The affect of global warming has a significant impact on everything from unpredictable weather patterns and cycles, to the rapid melting of the polar ice caps and as such global warming is disturbing the natural ecosystem of the Earth. Almost all scientists agree that the Earth’s greatest threat and major contributor to global warming is an increased concentration of carbon dioxide (CO2) and other types of upper atmospheric pollutants as a direct result of burning fossil fuels. It is also agreed that the use of renewable energy sources (including solar, wind and biomass) as an energy resource, is not only cleaner and greener for the planet with regards to most fossil fuel pollutants, but its continuous use represents a closed-loop and balanced carbon cycle with regards to the reduction of atmospheric carbon dioxide. Whether you believe in it or not, the main effects of global warming is that the Earth is getting warmer every day as the average temperature of the planet slowly increases. We have all seen on the TV and news channels the melting of the polar ice caps and regions as the temperature rises by about one degree Fahrenheit each year. This total or partial melting of the polar ice caps deposits enormous masses of liquid water directly into the sea increasing sea levels around the globe. Normally, snow and ice reflect most of the incident sunlight from its surface. The polar ice caps being covered in snow and ice can therefore reflect a very high percentage of the incident solar radiation that falls on its surface. However, the reduction in the size or even their disappearance will had to the increase in the planets average global absorptivity, thus accelerating the rate of climate change as a result of global warming which in future could reach to dangerous levels. Another effect of global warming is climate change. The greenhouse effect threatens to change the entire global climate due to a rise in the average global and regional temperatures, with some regional increases more significant than others. This will of course have an unwelcoming effect on agricultural and economic activities around the world which depend on a constant climate, predictable summer and winter seasons and healthy amount of rainfall throughout the year. Then any changes in regional climates along with rises in sea level, of any magnitude will inevitably disrupt if not destroy the entire economic life of the planet. So we can see that global warming could result in the permanent displacement of millions of peoples. While we recognise that global warming and climate change are real, in most parts by human activities, we also recognize that there is still a need to reduce the amount of harmful emission of greenhouse gases in order to prevent the worst impacts on our planet. However, not all the effects of global warming and climate change are a result of man’s activities. It may seem obvious that burning fossil fuels is driving global warming, or at very least, making global warming more worse than it would otherwise be. But recent climatology studies have shown that the sun undergoes an 11-year sunspot cycle which can have a definitive effect upon the global climate. Variations in solar flares and sunspot activity also has a significant affect the Earth’s average temperature. As we have seen throughout this Alternative Energy Tutorials website, the sun is the planets ultimate source of energy and heat. The energy of the sun, which is converted into electricity and heat by photovoltaics, solar panels and wind turbines, is the most significant factor controlling the Earth’s climate. Global temperatures depend heavily on the balance between solar radiation absorbed and the infra-red radiation released by the Earth. The atmosphere around the Earth has the capacity to entrap any infra-red radiation coming directly from the Sun to the Earth keeping the global temperatures at the required level necessary for the survival of life here on the Earth. But human development and activities has increased the amount of harmful gases within the atmosphere to disturbing levels that nowadays the so called “greenhouse effect” is disturbing the balance of our planet as the atmosphere is prevented from reflecting most of the sun’s radiation back into space, thereby raising the surface temperature of the Earth. The concerns of global warming from greenhouse gas emissions have intensified further the issues from the environmental impact of fuel consumption. The combustion of fossil fuels generates large amounts of carbon dioxide or methane due in part to the oxidation reaction between hydrocarbons and carbonaceous materials and are added to the Earth’s atmosphere. Carbon dioxide, CO2 is the major greenhouse gas and therefore its emissions need to be significantly reduced. Therefore, new developments in biofuels and bioenergy, as well as electric vehicles has reduced substantially the harmful exhaust emissions of carbon monoxide, unburned hydrocarbons, and particulate emissions from diesel engines. Renewable energy sources and bio-fuels are certainly very promising due to their long-term sustainability and unlike fossil-based fuels, alternative and renewables are cleaner for the environment. 1. Sustainability – Fossil fuels are not sustainable with the current global energy supply and demand. 2. Environmentally Friendly – Renewable energy sources save our environment for future generations. 3. Impact on Human Health – Renewable energy sources are clean energy with minimum emissions improving air quality. We have seen here that global warming and climate change create variations in the Earth’s atmosphere in which the average temperature of the Earth rises, melting ice caps, raising sea levels and has a negative effects of human activity. While the Earth’s weather may appear to be unpredictable and constantly changing, from a climatic point of view, the Earth’s weather patterns with regards to average temperature, days of sunlight, amount of rainfall, etc. are relatively stable and predictable throughout the year. However, the constant burning of petroleum oil, natural gas, coal and other such non-renewable sources produces large amounts of toxic smoke which pollutes the atmosphere and air we breath resulting in the unwanted effects of global warming. One of these effects is the production of greenhouse gases. Greenhouse gas is a gas, such as carbon dioxide or methane, that is added to the Earth’s atmosphere by human actions. These gases trap heat and contribute to global warming. Renewable energies can be used instead of traditional fossil fuels to heat our homes, fuel our cars and produce electricity. Replacing fossil fuels with cleaner and greener alternative energy sources will reduce the quantity of pollutants within the atmosphere which can cause acid rain and contribute further to global warming. The Kyoto Protocol, which is an agreement reached by many nations around the world, both developed and developing, for a reduction in the use and burning of fossil fuels intended to reduce the growth of CO2 global greenhouse gas emissions in order to slow or prevent global warming. The Kyoto agreement includes a reduction of energy consumption per capita, substitution of coal with renewable energy sources, Reforestation to naturally remove some of the CO2 from the atmosphere, and an increased use of renewable energy sources such as wind, solar, hydro and geothermal energy, and not just for the production of electricity. The impacts of global warming and climate change are not just confined to the effects of the planet. climate change also has an effect on human health. Cities are not only the main driver of climate change, they also bear the effects of global warming. Temperature rises in cities whether owing to natural or man-made causes, results in an increase in human causalities owing to dehydration and heat stroke. People with heart problems become more vulnerable in hot weather as they are unable to maintain and regulate normal body temperature. To understand better the effects of global warming, or to get a better understanding of the various renewable energy resources available for your home to help reduce the effects of global warming, or just to explore the theories behind global warming, then Click Here to get your book about climate change today. New research reveals that due to global warming the increase in ocean temperatures is causing the Earth to change color. According to researchers, the amount and types of phytoplankton have much to do with the color of the surface of the ocean. But what is phytoplankton? If you could put an article explaining how anyone at home could generate electricity for simple needs using solar panels, it’d be very useful. I mean , the type of solar panel, inverters, batteries etc and procedure for setting them up. If you already have it, please email it to me.